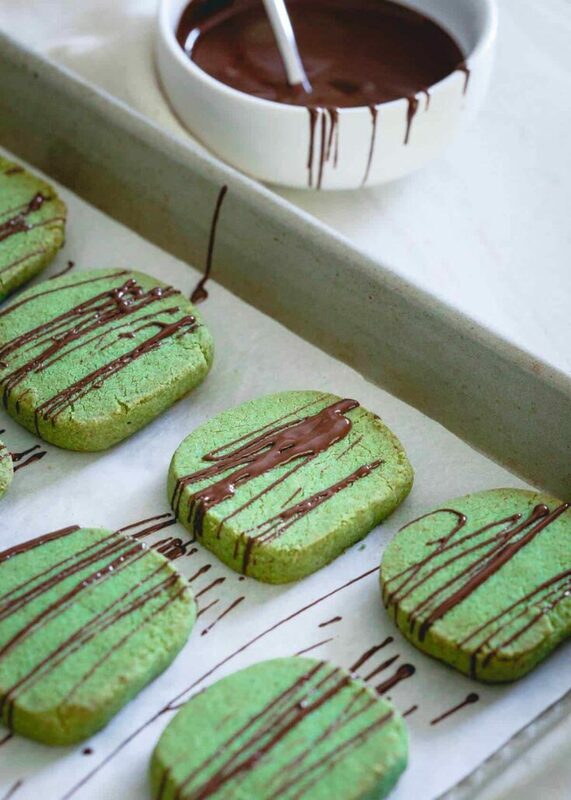 These chocolate drizzled matcha shortbread cookies are gluten-free, buttery, crispy and perfect for dunking in that cozy holiday cup of coffee or tea. If you asked me to rank my top 5 favorite kinds of cookies, shortbread wouldn’t even cross my mind to make the list. Cookies like these almond chocolate thumbprints and tart cherry fudge thumbprints would pop right to the top (I’m a sucker for a jam or chocolate center), followed closely by any soft batch, flourless or chewy-gooey concoction like these cashew almond butter cookies and shortbread would probably be pulling up the rear. Recently though, in my mad love affair with a mug of afternoon tea that happens every year once the temperature dips and our wood stove starts blasting away, my mind wandered to shortbread cookies and those Danish cookie tins that used to adorn our dinner table in the winter after every meal growing up. That’s when I remembered shortbread cookies and how perfect they were dunked in mug of black tea. I’ve tried really hard to like matcha. I will say, this matcha mint chocolate chunk ice cream was a huge step in the right direction and I do really love this matcha bread but that’s because almonds are disguising its true flavor. As far as drinking it straight up goes, I’m still not there. 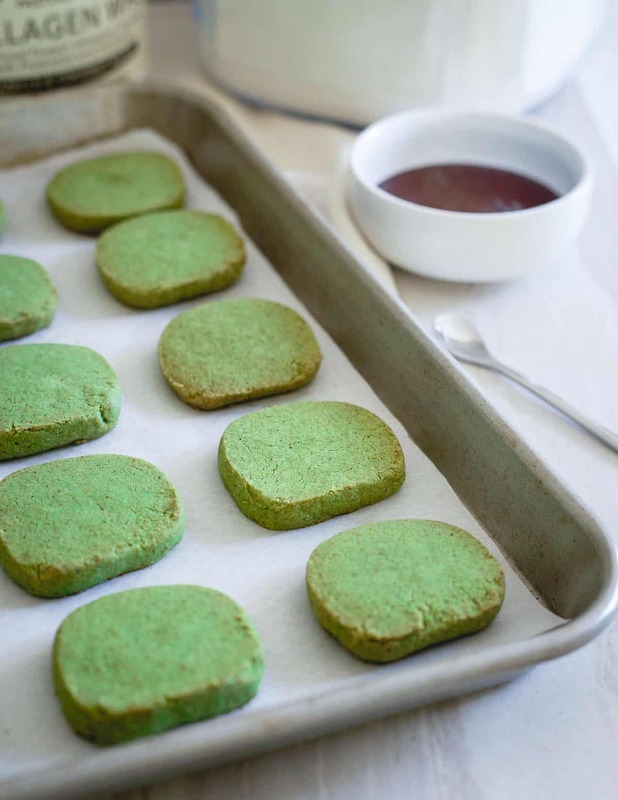 I’ve never loved green tea, I just can’t get past it’s grassy earth-like (nicer way of saying dirt) taste when sipped but since I didn’t mind it in ice cream, I thought why not try baking with it and making these matcha shortbread cookies? Shortbread cookies will never rival thumbprints in my book but when you boost them up with delicious vanilla coconut water whey protein and drizzle them in dark chocolate, they kinda become the most perfect buttery accompaniment to a warm mug of whatever you’re drinking right around the 3-4pm afternoon slump. For me it’s usually a cup of aromatic black tea and a splash of milk, no sugar! My mom recently decided to go gluten-free for a bit for health reasons. When she was visiting last weekend and found out these were gluten-free (and filled with healthy collagen boosting protein), they quickly started disappearing from the container they were stored in. So here’s your gentle remind about gluten-free, it doesn’t = healthy. With almost a full stick of butter in these, healthy wouldn’t be the descriptor that comes to mind first. 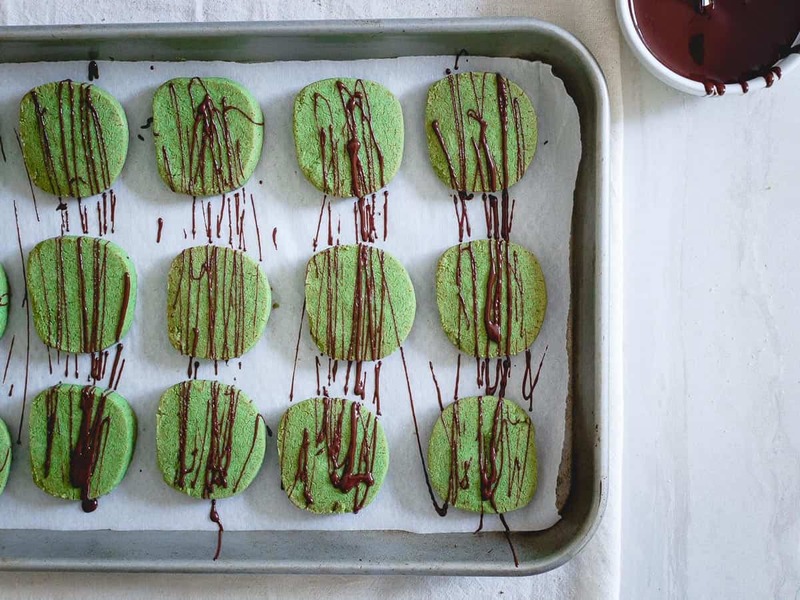 That said, these matcha shortbread cookies are festive (that green is completely natural! ), have health boosting ingredients like the wondrous matcha and collagen and if ever there’s a time to indulge a bit, it’s this time of year! 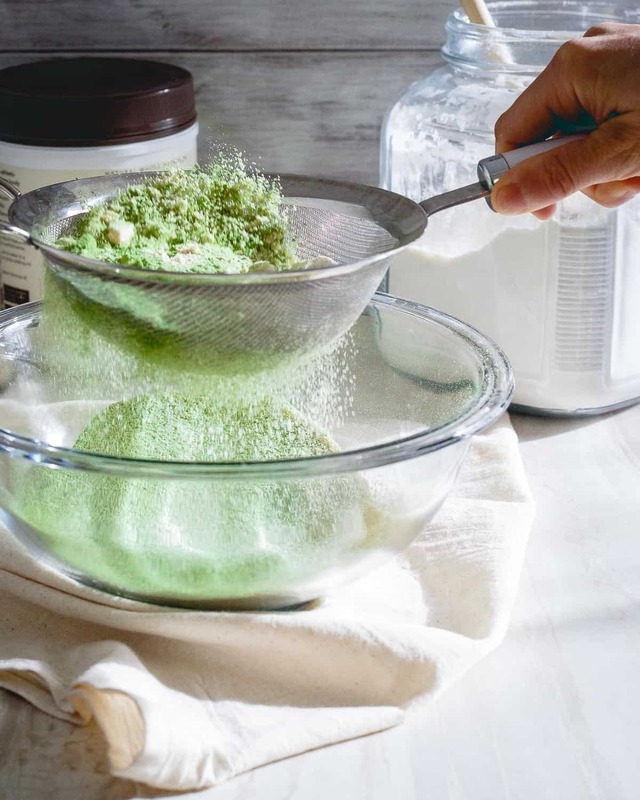 Sift the flour, whey, matcha and salt together into a large bowl. Place the butter and sugar in a bowl of a stand mixer fitted with the paddle attachment and beat until light and fluffy. Reduce the mixer speed to low and slowly add the flour mixture. Beat until just incorporated. Turn the dough out onto a large piece of plastic wrap, form into a 2" wide log shape, wrap and place in the refrigerator to chill for 1 hour. Remove dough from the refrigerator. Using a sharp knife, slice into rounds about 1/4" to 1/3" thick and place on a parchment or silpat lined baking sheet. Bake for 10-12 minutes until edges just start to turn golden brown. Remove and let cool on baking sheet for a couple of minutes before transferring to a cooling rack to cool completely. Drizzle the chocolate over the cookies as desired and let set for a few minutes to harden. You can place them in the refrigerator for 10 minutes to speed this process up. what an amazing flavor you have going on here! love these shortbread cookies!!!! I had to stop by and check out what you made after seeing yesterday’s IG post. 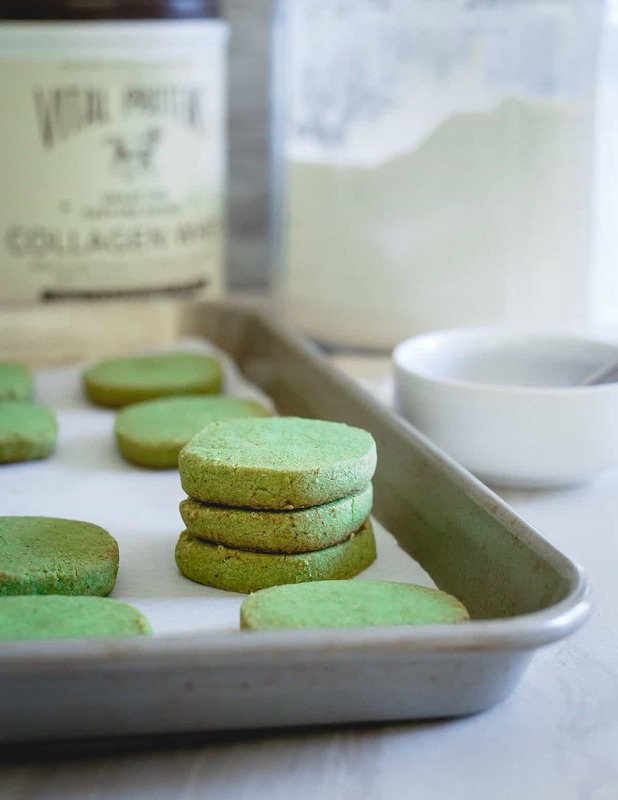 Glad I did, because these matcha shortbread cookies look awesome! I always need a little chocolate with the matcha…cuts that grass flavor (Ha! no pun intended)! 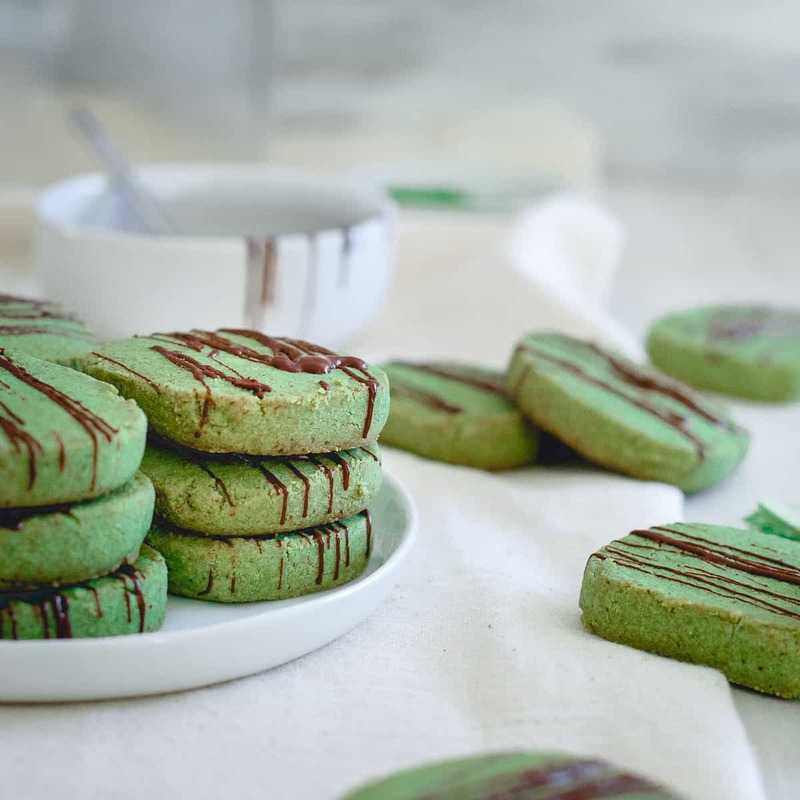 LOVE a chocolate drizzled cookie and I am really into matcha right now so these are awesome! Pretty festive cookie you got here Gina! 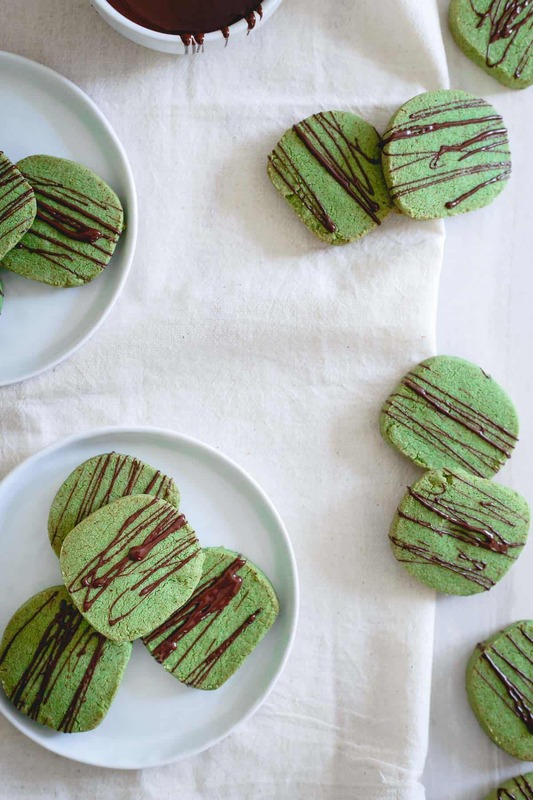 Never thought of a matcha shortbread cookie! Bet they taste amazing! I love matcha and the green is super festive. What a fun cookie! Nice sifting shot! Love the natural green coloring in these. These are beautiful! I haven’t ever cooked/baked with matcha, I need to get on board. Your new blog design looks awesome! Love it! Any matcha powder will do.